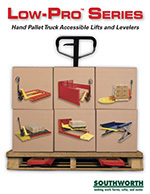 The ideal solution for loading or unloading pallets. 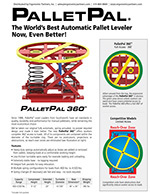 The PalletPal 360 is an ideal lift table for loading and unloading pallets faster, safer and easier. The automatic load leveler unit uses a system of springs and shock absorbers to lower and raise loads as product is added or removed from pallets. A turntable allows nearside loading and unloading. No power or air supply is required. This load leveler can handle pallet loads up to 4,500 pounds. 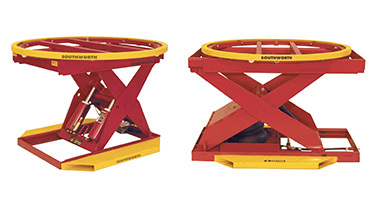 Unique to the Southworth Pallet Pal 360, all of its components are contained within the diameter of the turntable ring. Hence, there is a not framework protruding, eliminating any area of extended reach. Capacity from 400 pounds to 4,500 pounds. Compressed height of 9-1/2 inches. Extended height of 28 inches. Heavy-duty springs calibrated to bring pallet to most convenient loading and unloading height. 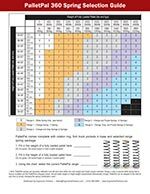 SEE SPRING SELECTOR GUIDE. Dampener provides smooth, gradual raising and lowering action, without overshoot or spring bounce. Fork pockets for relocation by fork truck also extend base for free standing stability. This model is designed for users whose pallet loads vary widely. 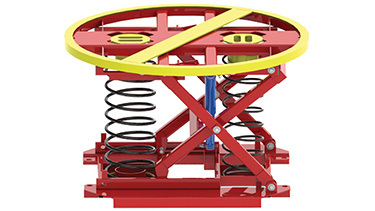 The airbag/spring combination provides virtually linear response, and the spring provides a measure of safety by supporting the unloaded turntable in the event of accidental air loss from the airbag. The pneumatic hookup is simple with only two connections to get the unit up and running. The unit is equipped with fork pockets for easy relocation and to provide a stable base that does not require it to be bolted to the floor. Features Include: Capacity from 400 pounds - 4500 pounds, Compressed height of 9-1/2", Extended Height of 30-1/2". 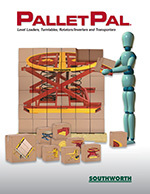 When loads and pallet sizes vary greatly, a Powered PalletPal with total operator control is the solution. A foot control gives the operator vertical adjustment of the load to an infinite number of positions up to 32-3/4 inches (plus pallet height), so it's always at the most comfortable working height. The manual turntable top allows easy rotation of the load so that the operator is always working on the side closest to them. Available in 2,000 and 4,000 pound capacities. Features: Low-friction bearing supported turntable, Fork pockets for easy relocation, Wide base for exceptional free standing stability, Optional bellows skirting, One-Touch Auto Leveling, Optional 460V power. PPH2-24 2,000 lbs. 8-3/4 in. 32-3/4 in. PPH4-24 4,000 lbs. 8-3/4 in. 32-3/4 in. Similar to the hydraulic unit above, this table utilizes a heavy duty airbag to position loads up to 4,000 pounds with as little as 80 psi. A foot valve allows the operator to adjust the load to any position up to 33-1/2 inches. Features: Low-friction bearing supported turntable, Fork pockets for easy relocation, Shock absorber style dampener for smooth gradual raising and lowering without overshoot or bounce, Wide base for exceptional free standing stability. PPA2-24 2,000 lbs. 9-1/2 in. 33-1/2 in. PPA4-24 4,000 lbs. 9-1/2 in. 33-1/2 in. 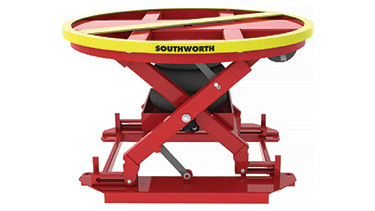 Ergonomic Partners provides Southworth PalletPal's; from coast to coast, Canada, Mexico and especially focused in the states of Missouri, Illinois, Indiana, Kansas, Arkansas, Mississippi, Nebraska, Tennessee, Kentucky, Iowa, and Oklahoma.